WTI’s V-Max series is the ultimate solution when conventional cable installations are impractical or impossible. It can provide simultaneous real time transmission of video, dual-channel audio and/or RS-232 data. It provides exceptional wireless performance in all climates and is unaffected by fog, rain, or snow. WTI V-Max goes where cable can’t - in all climates and adverse conditions. 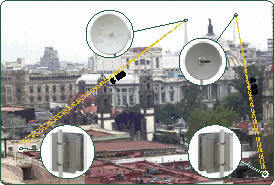 This system is for moderate range transmission up to two miles. The V-Max I utilizes an internal Phased-Array microstrip antenna on both the transmitter and receiver. This system is for longer range transmission up to four miles. The V-Max II transmits with an internal, Phased-Array microstrip antenna and receives with an external, mast-mounted, low-gain, dish antenna. 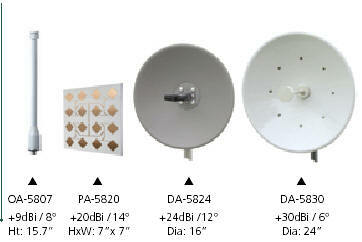 This system is for distance transmission up to six miles The V-Max III transmits with an internal, Phased-Array microstrip antenna and receives with an external, mast-mounted, high-gain, dish antenna. The V-Max System includes: (1) Video Transmitter, Internal Transmitter Antenna, (1) Video Receiver, (1) Receiver Antenna, (2) Internal Universal Power Supplies, (1) Installation/Operations Manual, (2) Pole Mount Brackets and Mounting Hardware. institutions, as well as secured sites such as guard stations, parking lots, homeowners associations, schools and colleges and hotels. The V-max 5800 system has a variety of components that adapt to suit various installations and configurations.